I have grand plans of cooking fish once a week, but it ends of being once every 6 months or so. I totally forget about fish. I don’t know why I don’t cook fish more often, it cooks so quickly. 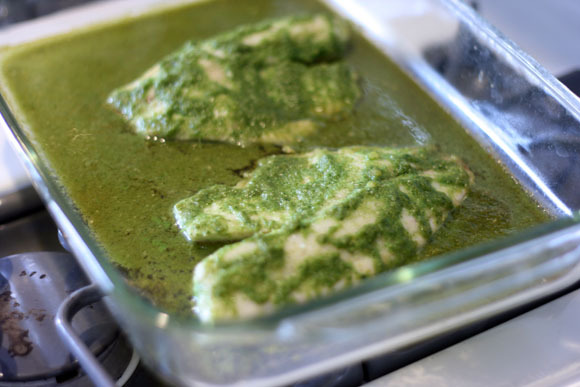 This Baked Ginger Cilantro Tilapia takes less than 30 minutes to prepare and cook. Since I had extra cilantro, I added a handful to the brown rice along with freshly squeezed lime juice. 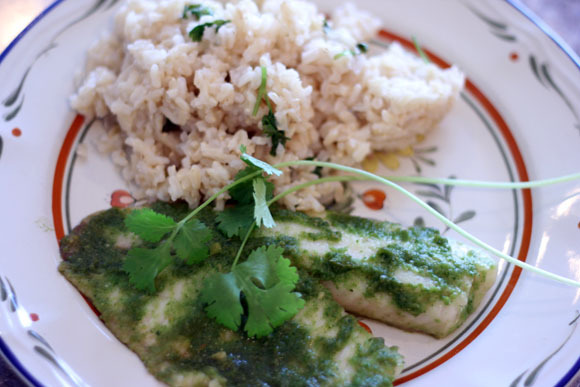 The lime juice made for a great flavor combination with the Baked Ginger Cilantro Tilapia. Preheat oven to 475°F and lightly grease a glass baking dish. Season the fish with salt and pepper and place in the baking dish. Put the garlic, ginger, cilantro, water, soy sauce and sesame seeds together in a blender or food processor. Blend to combine. Pour this sauce over the fish. Bake until the fish is cooked and flakes apart, 8-10 minutes.